In Beckmann’s painting Christ occupies a central position of authority. All the personages around him (sometimes represented only by gestures) are reacting on the fact that he protects the “promiscuous” woman. Most of them are hatefully indignant by Christ’s position toward “sinner” and “sin” that is opposite of the typical one (of condemnation and punishment). In today’s language, Christ’s position is a “liberal” one – that of empathy and compassion. From the majority’s point of view, real authoritative figure must not behave like this. He must judge, condemn and punish. The behavior of Christ registered by Beckmann is an assertion of a democratic sensibility where an authoritarian/totalitarian code of behavior is considered the proper and normal. The Beckmann’s Christ’s attitude toward the “harlot” in the eyes of the crowd during Christ’s own life time and of American conservatives today is equal to “sexual permissiveness”, “tolerance toward sin”, “encouraging “sinful conduct”, even “sympathy toward sin and vice”. Conservatives tend to be dogmatic and are prone to be intolerant and manipulative especially with dissimilar people. Empathy and compassion are possible only if a person is capable of identifying with the otherness of the other person – with his/her humanity in spite of otherness. Primitive people are able to identify with others only by the principle of similarity/identity. For them the position Christ takes in this situation is not understandable and is even absurd. There is a gap between Beckmann’s approach to the scene he depicts and the “orthodox” position of dogmatic Christians who follow the pre-Christian morality despite their worshiping of Christ (unknowingly they worship Christ as a pagan deity just because of not enlightened condition of their emotional life). The social episode Beckmann refers to in “Christ and Woman…” is typical for most cultures and for most of our history. It is a scene when a crowd of righteous vigilantes is ready to violently punish the transgressor/sinner by their own initiative. In US today people become especially prone to vigilante “justice” (the growth of ownership of private fire-arms with technologically enhanced killing power is a part of this phenomenon). In Beckmann’s painting we see that it is democracy itself that comes between the totalitarian vigilantes and their potential victim, a democratic sensibility based on Christian sensitivity. 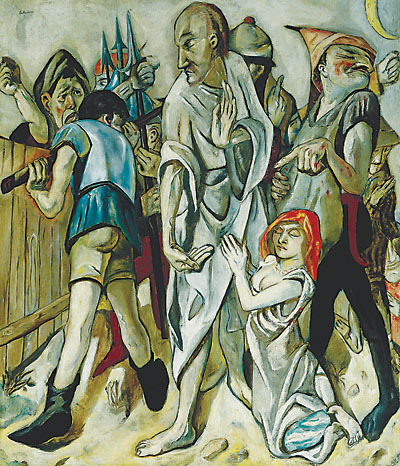 The role of the soldiers in Beckmann’s depiction of the scene is to isolate Christ and the transgressed “moral code” woman from the mob. It is not the soldiers who are the personification of militancy – but the righteous bigots who think of themselves as the defenders of morality. Two emotions dominate the vigilante psychology (of the people who rush to prove that they are real guardian of moral values) – hate (represented by the woman on the left screaming threats and condemnations), and disgust-and-contempt (the man on the right of the canvass pointing finger at Christ who protects the accused woman). Raised fists are direct expression of hate, and finger-pointing – of disgust/contempt. There are three raised fists in the painting (hate, according to Beckmann, is the monster not with two but with three fists). And because the gesture of (contemptuous) finger-pointing is in a special proximity to the third raised up fist, they are combined as a psychological aggregate (where we see hate there will also be contempt and vice-versa). The flying fist right behind the contemptuous man is as if belongs to him. May be, it is Beckmann’s hint that hate for a “morally” indignant person (from his perspective) is like angelic wing. Right behind the figure of Christ we see a hand with its finger pointing to the heaven – to God’s power, to God’s commandments. It can be the gesture of instigating punishment, but it can also be a response to the screaming figure on the left with the intention to remind people that it is not our human business to punish private and non-violent behavior in the name of God, that God doesn’t need human help to reinforce His Will. Christ is privileged to have not one, as most of protagonists of the painting, but two gestures, delivered by his two hands. His left hand is pacifying people’s hate while his right hand is elevating the value of the sinner in spite of her sin. Christ wants her to get up from her knees. His eyes are directed toward the hateful woman (who is screaming condemnations) but without any authoritarian forbidding, just with plea for mercy toward the “sinner”. Are his eyes opened or closed? Contrary to “aggressive” eye-to-eye contact when two pagan wills probe one another, Christ’s eyes are opened/closed – opened without any pressuring or closed without any withdrawal. Besides Christ the contemptuous finger-pointer is the only other personage whom Beckmann provides with the ability for making two gestures. This makes this figure as if of a special status – a kind of opposing Christ. Beckmann suggests that psychologically contempt/disgust as emotions have a super-human pretense (that it is not like hate that is rather ordinarily human – horizontal emotion). A person who feels contempt toward another human being positions him/herself above human level (or positions another person beneath it). While hate is peer emotion contempt is hierarchical feeling. Beckmann defines contempt as a demonic feeling, and makes the contemptuous/ morally disgusted person to personify a sin of pride. Here we see a door opening into Beckmann’s Christian theology – God is someone who becomes human, Lucifer is not only proudly super-human but influences/seduces people to emulate his super-human position. Finger-pointing man with his right hand kept to himself contemptuously separates himself from the sinner and helper as if not to be soiled (the idea of punishment including death sentence comes from this feeling – as if as soon as I am for death sentence I am in the clear far from sin and crime). While both gestures of God-Son are oriented on people – one stopping hate, the other helping the victim of hate, finger-pointing hand of the contemptuous man almost touches his right hand – the both gestures are ego-centric, both are dedicated to making a point about “sinless” pride of this person who is laughing at Christ’s help to the sinner. According to Beckmann’s images, the devilish sin of being contemptuous is much more serious than transgression of sexual commandment because it is self-affirming and self-asserting by the price of humiliating other human being. The contemptuous man closed his eyes because he doesn’t want to see that “sin is being helped” (more exactly – he wants other people to see that he doesn’t want to see Christ helping a sinner – which is another way for him to say that he is pure from sin). He is also mocking the position of the woman’s hands in relation to Christ’s body as if hinting that Christ Himself has sinful interest in her. It is very difficult not to recognize in Beckmann’s finger-pointer today’s conservatives with their hypocritical accusations against the “sinful democrats” while hiding their own “sins” and “vices” in the deep closet. The more silently a person sits inside the closet the noisier s/he becomes outside of it. The “sinned” woman is praying for Christ, her prayer is of gratitude to him for allowing her to stay human, not to be reduced to sub-human level of the “whore” as a punishment for her sin. But the old woman (behind the contemptuous man) is praying for her heavenly salvation. The prayer of the sinned woman is life-affirming, while that of the old woman is life-negating (eternity-asserting). Old woman’s feelings are de-existentialized while in the accused woman it is a matter of losing or keeping self-respect, a matter of living, not of eternal salvation. As a matter of fact, the position of the old woman’s hands is not completely certain, may be, she is not praying but remembering her life (looking at small amulets), may be even remembering her own “adulterous“ sin(s) – “immoral” love affair(s) long ago. She shares with both Christ and the “harlot” paleness while hate and contempt (and unconscious shame accompanying them) are passions that put red glance on people’s cheeks. Sinned woman’s shawl is of the same color as the hair of an anonymous guy behind the soldiers. Is he a man she sinned with? Why has he turned away – does he feel guilty? May be, he is rushing to escape? Is he afraid of being identified by righteous passions of the crowd? Is this scene taking place during the strife times under the crescent phase of the moon (a moon-dagger)? Three hand gesture of righteous hate. Four hand gesture of soldiers keeping weapon. One hand gesture of pious pointing to the sky (reminding about god’s punishment). Two hands-two gestures of Christ’s love (of pacifying hate and supporting life). Two hands-two gestures of righteous contempt (derisive contempt and disgusted self-withdrawing from the object of contempt). Two hand gesture of petitionary prayer or remembering her own sin (by the old woman). Two hand gesture of life-affirming prayer of gratitude (by the adulteress). In these nine gestures and sixteen hands, according to Beckmann, lies the very social-psychological destiny of the position toward sins in Christian nations (where the majority of people today, including many passionate believers in Christ, are as far from Christian morality as they were more than 20 centuries ago). Beckmann is not a Christian dogmatic believer. He returns us to the very birth of psychological/moral Christianity to help us start from here again.